Happy 1st Birthday (to This Blog)! I created this blog exactly one year ago. A lot has happened in the world of local search since my first post. Although LocalVisibilitySystem was born in ’09, today also marks one year since I went live with the site in its current form. It’s the site I always wanted to have. If you’re one of my “old-timers,” you may recall that things used to look wayyy different (just a couple of really long pages and no blog posts). The site’s coming along, but it’s just the beginning. Every day I learn something new from my clients, fellow local-searchers, and other great people. All I’m doing is dipping my cup into a river of fresh, useful ideas on local search. So, in order to keep the good stuff coming, I’ve got to know: what would you like me to write about next? Or do a video on? In other words, what would you find useful in your ongoing push for more local visibility to customers? Just leave a comment! It doesn’t even have to be an idea for a post: I’d really appreciate any suggestions for what you think would be a good addition to this site. I know the next year will be every bit as crazy as the last one. The recent merging of Google Places and Google Plus has already made for a wild ride. But my purpose is still the same: to help make sense of it all and to help you get or stay visible to local customers. Thanks for tuning in so far, and stay tuned for more! Hey Phil, happy 1 year to your blog!!! I celebrated my own pretty recently, too, so I know the feeling of awesomeness when you managed to stay sane and pull it for a year. I myself have always believe this is some kind of a very important milestone. After you’ve been one year in the game you already have a proven track and history of quality work you are doing. This is not valid only in blogging but in pretty much anything related to online, where changes pop up much faster than anywhere else in the real world. Thanks for the great work, and please, keep it up!!! 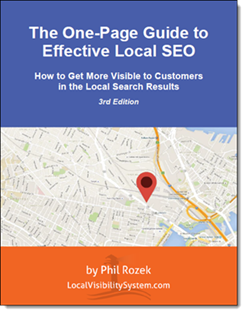 If I had to do it all over again, I’d have started the blog 2+ years earlier – when I actually started in local search – but on the other hand the past year+ was far more exciting than ’09 – ’10 were in local search (IMHO). Thanks for all your great insights on this blog – and do keep up the great work on yours, too!